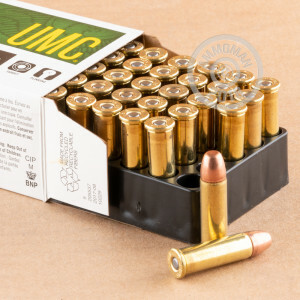 Remington UMC has been around in one form for another for more than 150 years, so it's no surprise that UMC ammo is considered reliable and affordable for range use. 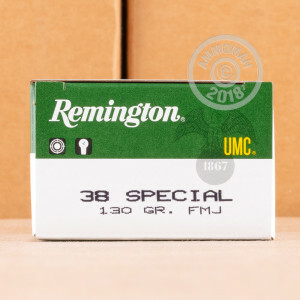 This case of 500 rounds in .38 Special is the perfect target load for your .38 Special or .357 Magnum revolver. It uses a 130 grain full metal jacket bullet, which produces much less lead exposure and fouling than the traditional lead round nose load at a minimal difference in cost. Each round uses non-corrosive Boxer primers and reloadable brass cases. The .38 Special revolver cartridge, first introduced in 1898, was once the predominant law enforcement service pistol round. Today, it enjoys a continued following among cops for backup guns as well as among CCW holders who value its good accuracy, low recoil, and strong terminal performance with modern hollow points. All orders over $99 at AmmoMan.com ship for free, with no added charges at checkout. You pay the list price, nothing more!